The wrong anti-snoring pillow can aggravate your snoring problems and cause great discomfort as well. That is why it is imperative that you choose wisely and take every aspect of the product into consideration. This Snore No More Pillow VS MyPillow comparison allows you to see exactly how good these two anti-snoring pillows are and which one of them is more likely to help you stop snoring. Science Of Sleep is an anti-snoring pillow that keeps your chin in the right position as you sleep, which makes it a good remedy for snoring stemming from an improper sleeping position. It will prevent airway blockage, thus allowing you to breathe normally. Science Of Sleep Snore No More Pillow should remain effective for 4 to 6 months. After this period, the pillow may flatten and a replacement may be required. 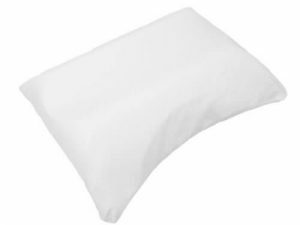 Science Of Sleep Snore No More Pillow is made of rigid polyurethane, which makes it one of the firmest contour pillows on the market. It also comes with a cotton zip cover that can be easily removed and washed in your washing machine. Science Of Sleep Snore No More Pillow may require a longer adjustment period (a couple of weeks) if you are used to sleeping on feather and down pillows. If you are accustomed to firmer pillows, you should get used to it in just a couple of days. Science Of Sleep Snore No More Pillow helps you solve your snoring problems in a completely natural way. Its contour design and ergonomic shape keep your chin from sinking into your chest, which prevents airway blockage. Note that this anti-snoring aid only works if you sleep on your back. Science Of Sleep Snore No More Pillow is not machine-washable or dryable. The company recommends only cleaning the pillow with a damp cloth and some mild detergent. You can repeat the process every couple of months. The cover, on the other hand, can be machine-washed and tumble-dried. Science Of Sleep Snore No More Pillow has no known side effects. If you are not satisfied with your Science Of Sleep Snore No More Pillow, please contact your chosen retailer. Refund policies may vary between different sellers. Science Of Sleep Snore No More Pillow does not come with a warranty. This pillow definitely helps with snoring and allows me to have a proper night's rest. Having said that, it's a bit too flat for my taste so I usually have to put another pillow underneath in order to get comfortable. While I wouldn't go as far as to say this pillow eliminated my snoring problem, it has definitely reduced it to a acceptable levels. Additionally it has turned it into more of a gargling sound then an actual snore. Long story short, I can finally sleep in the same room with my wife without her constantly waking up during the night. I chose this pillow because it was created by a trusted manufacturer. It works with your neck so you want to be extra careful. I didn’t find it very comfortable but it was fairly effective. I’m still getting used to sleeping on this pillow, it’s a bit uncomfortable, but it has helped me with my snoring. It’s not an ideal solution but I like it more than mouthpieces. Science Of Sleep is an anti-snoring pillow designed to keep your chin in the proper position instead of allowing it to fall toward the chest. Read more about its strengths and weaknesses in our comprehensive Science Of Sleep review.